Quick and speedy dinners is all I have time for these days and this recipe has it all . It can be ready in under 20 mins. I swapped the traditional hokkien noodles for more nutritional Soba noodles, as they contain higher protein, minerals and vitamin B. They are as high in carbs as spaghetti, but they will keep you fuller for longer, being made from buckwheat flour and having a higher fibre content. 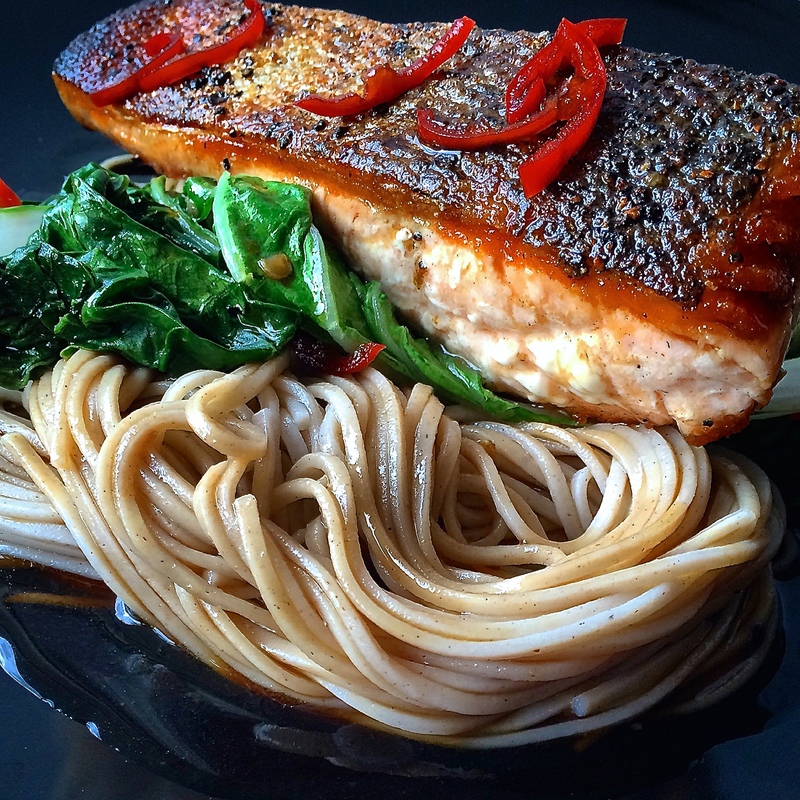 No need to tell you about the health benefits of salmon, it’s just down right so good for you! Combine the honey, soy and chilli in a small bowl, set aside. Season the salmon, both sides with sea salt and ground pepper.Heat a fry pan over med-high heat, add 2 tsp oil and 1 tsp sesame oil, cook the salmon skin down for 3-4 mins, until nice and crispy. Turn over and cook for a further 2-3 mins, depending on how pink you like it. Take off heat and add half of the dressing. Meanwhile heat a large wok with the remaining oil and sesame oil, add your greens and ginger, stir fry for a couple of minutes, pour in the rest of the dressing, add the noodles and take off heat. To serve place the noodles and greens on a plate and place the salmon on top, pouring anything left in the pan, over the top. I usually make this recipe for 2 people and keep the remainder sauce in the fridge. It will last about a week and is great tossed through brown rice or quinoa, poached chicken and vegetables. This recipe was adapted from Delicious Magazine- Valli Little. Aww this looks so good. I love crispy salmon skin!